In existence since 1898, Carpenter & Company is a highly respected and experienced developer, owner, and manager of real estate. Carpenter was incorporated in 1973 by is current President, Richard L. Friedman, and since that time has established an impressive record of diverse and innovative projects, including hotels, shopping centers, office buildings, and housing. 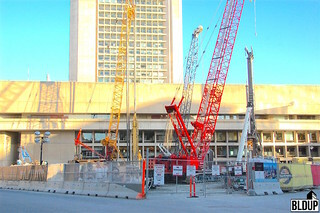 Among Carpenter’s many development projects are the conversion of Boston’s historic Charles Street Jail into the luxury Liberty Hotel, the construction of the 42-story St. Regis Hotel and Residences in downtown San Francisco, and the development of Charles Square, an 800,000 square foot mixed-use project that includes the iconic Charles Hotel adjacent to Harvard University. 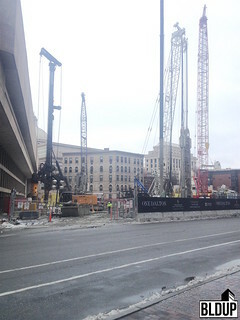 The tower crane for the 61-story One Dalton has started shrinking as construction is nearing completion for one of Boston's most anticipated projects. The 712,500 square feet development will include 180 luxury condos along with a 215 room Four Seasons Hotel. Residents and guests alike will have access to an array of amenities including a fitness center and spa with lap pool, Zuma Restaurant, and a 5,000-square-foot park designed by award-winning landscape architect Michael Van Valkenburgh. One Dalton is expected to open late next month. With a spring opening fast approaching, the final pieces of One Dalton's glass facade are being put in place. These last sections will enclose the duplex penthouse homes on the building's 60 & 61st floors. One Dalton will be the tallest residential tower in New England at 740 feet with the upper floors containing 180 private luxury condos. Underneath will be a Four Seasons luxury hotel with 215 rooms. At the base of the tower, work is also being completed on the building's grand entrances, one for the hotel and one for residences. Both residents and guests of the hotel will have access to numerous amenities including a fitness center, spa, and indoor pool. Construction is set to be complete in April. 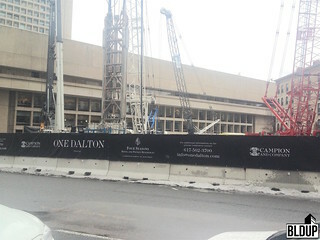 One Dalton has been rising to its full height for the past several years, changing the face of the Boston skyline. Now BLDUP has been given a sneak peek inside the luxurious $750 million project and we were not disappointed. First stop the construction elevator to the 61st floor. 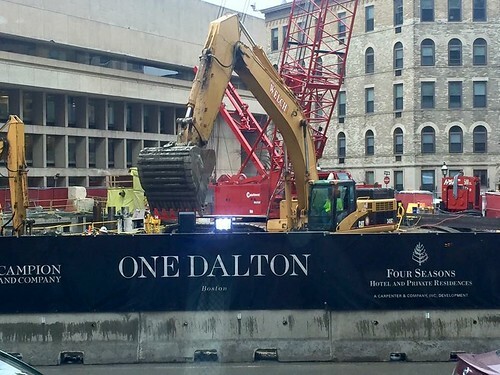 At 740 feet, One Dalton will be the tallest residential tower in New England. The top floor along with the 60th below will be home to three ultra-luxurious Penthouse Estates. The 360-degree views, even on a cloudy day are nothing short of amazing. You’ve got Fenway Park, The Charles River, Cambridge, Downtown, and you could practically reach out and touch the Prudential Center. On a clear day, I’m told you can see the Berkshires. Along with the views, the Penthouse Estates will each feature Blue de Savoie polished marble countertops and backsplashes paired with SieMatic cabinets, bathrooms featuring heated glazed marble floors and Dornbracht fixtures and a double-height terrace complete with outdoor fireplaces. There is also a service corridor neatly tucked into the back of each unit that will allow the hotel staff to deliver packages, dry cleaning, or room service unnoticed. Two of these homes are already sold, with the third remaining available at $40 million. Debbie Collins, Director of Sales for Carpenter & Company tells BLDUP the residences at One Dalton are the fastest selling residential development in Four Seasons history. And this is without advertising or marketing. The developers at Carpenter and Company, have run a whisper campaign to date. This word of mouth coupled with the Four Seasons brand has brought in buyers from throughout Boston and beyond. Floors 26 to 61 of the tower are residential space with no more than 6 units on a given floor. There will be 6 elevators total allowing for easy access to these sky-high condos. The residents will have access to all the hotel amenities below along with the 50/50 Club, a private residents only space on the 50th floor. The development team is converting what would have been a $12 million condo into additional amenity space for the elite homeowners. After taking in the views, we venture down to the lower floors to check in on the hotel portion of the building. Here finishes are being installed and a sophisticated blend of textiles and textures gives the hotel the opulent feel you would expect from a five-star resort. Every attention has been paid to detail from the millwork on the closets to the door handles that are shaped to look like the building. There will be 215 hotel rooms in total in this prime location between Back Bay and the South End. A stylish black vanity featured in the hotel bathrooms. Next, we make a stop on the 7th floor, the entire space dedicated to Health and Wellness. There will be a spa, fitness center, and 65 ft curved lap pool. Unfortunately, the pool was covered during our visit but you could still see the beautifully tiled walls and comfortable design of the space. We also saw what will be the fitness space, as with the rest of the building it features numerous large windows for an airy, open feel. We were then able to see what will be one of the luxurious ballroom spaces. Even through the construction, you can see how impressive these spaces will be when complete. The 65-foot curved lap pool will offer guests and homeowners a year-round retreat. A pre-function space leading to an opulent ballroom. Heading downstairs again, we hit the 2nd floor, food, and beverage, which will feature Zuma, Izakaya-style Japanese dining. Zuma’s culinary concept features a main kitchen, sushi counter and robata grill offering modern, sophisticated Japanese cuisine. As we exit past the site of the upcoming 5,000sf park, I learn what might be my favorite little gem of information about the property, all the sidewalks surrounding the project will be heated. It seems the development and design teams really have thought of everything. With an expected opening in just several months, April 2019, we can’t wait to see One Dalton complete. One of what will be two grand entrances to One Dalton (separate for the hotel & residences). Install of the glass facade for the 61 story, 740-foot tower is nearing its apex at One Dalton. The massive new Four Seasons Hotel and Residences will include 180 luxury condominiums and a 215 room hotel. Building amenities will include a lap pool, fitness center, salon, and 50th-floor residents lounge. There will also be a new 5,000 square foot park built at the tower's base. One Dalton is scheduled to open in Spring 2019. The highly anticipated One Dalton tower has topped off on this sweltering August day. The $750 million project will be the tallest residential tower in New England at 740 feet and 61 stories tall and will consist of 712,500 square feet of residential, hotel and retail space. One Dalton's upper floors will contain 180 private luxury condominium residences. Underneath will be a Four Seasons luxury hotel with 215 rooms. One Dalton building amenities will include a lap pool, a fitness center, a salon with manicure, pedicure and hair styling services, a private yoga and pilates studio, a golf simulator room with a wet bar and a private theater room. A 50th floor Private Residents’ Club Lounge designed by Thierry Despont will feature a dining room, a lounge area, a fully appointed bar and catering kitchen and a terrace with sweeping views of the Charles River and Boston skyline. A new 5,000 square foot park will be constructed at One Dalton's ground level. Construction at One Dalton has reached the 60th floor and is proceeding at a clip of about one and a half floors per week. Upon completion, One Dalton will be the tallest residential building in all of New England – transforming Boston’s skyline at 742 feet tall. One Dalton, which will house 215 Four Seasons hotel rooms and 160 luxury condominium residences, is scheduled top off in July 2018 and the new five-star Four Seasons hotel will be open for business in March 2019. Work continues on the exterior of One Dalton with over half of the exterior glass facade now in place. As the 61 story tower continues to take shape it's presence has already changed the iconic Boston skyline. With an expected opening of first quarter 2019, pre-sales continue as buyers look to join this exclusive new community. One Dalton will be the tallest residential tower in New England at 740 feet and will consist of 712,500 square feet of residential, hotel and retail space. One Dalton's upper floors will contain 180 private luxury condominium residences. Underneath will be a Four Seasons luxury hotel with 215 rooms. 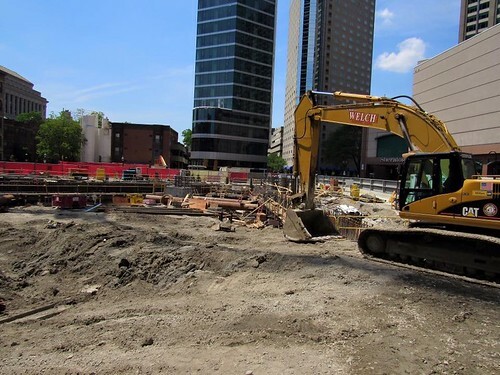 One Dalton’s 23-story, 215-key hotel component has topped off, and work has begun to construct the tower’s 180 luxury condominium residences and exclusive amenity spaces on floors 24 through 61. 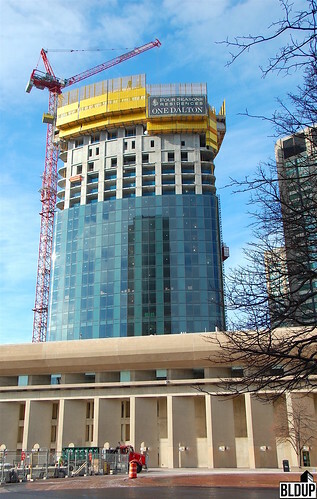 About 20 stories of One Dalton’s blue glass curtain wall facade have been constructed, and the tower is now beginning to surpass the height of the adjacent 30 Dalton and Sheraton Hotel towers on its’ way to becoming the Back Bay and Boston’s third-tallest tower at 61 stories and 740 feet high. 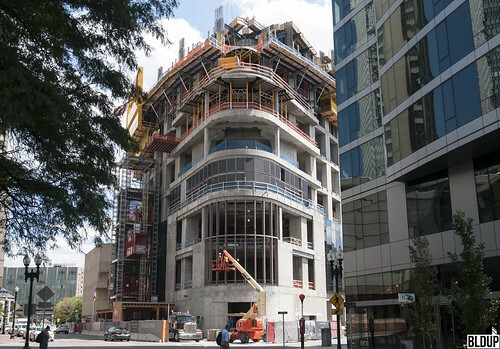 One Dalton’s concrete superstructure is expected to top off in mid-2018, with completion expected by late 2018. Condominiums at One Dalton are now on sale starting at $2.75 million. At the tower's summit will be three two-level Penthouse Estates, two of which are reportedly under agreement. One of the Penthouse Estates has reportedly sold to Dell Technologies Chairman & CEO Michael Dell, and one reportedly sold for about $40 million. A third Penthouse Estate is currently offered for $40 million. Dell Technologies Chairman & CEO Michael Dell has reportedly entered a contract to acquire one of three $40 million penthouse residences atop the 61-story One Dalton tower under construction in the Back Bay, which, following Dell’s acquisition of a Millennium Tower penthouse residence last year, would make Dell the owner of penthouses at both of Boston’s, and New England’s, tallest residential towers. Per a Wall Street Journal report, Dell’s penthouse will be approximately 7,300 square feet in size across two stories, with a 570-square-foot outdoor terrace. Listed for sale at $40 million each, One Dalton’s penthouses are expected to be Boston’s most expensive ever sold, nearly 15% higher than the $35 million, 13,000-square-foot Millennium Tower penthouse acquired by billionaire John Grayken in 2016. Sales of condominiums at One Dalton have not yet closed. Dell purchased his 4,110-square-foot Millennium Tower penthouse for $10.9 million, closing on the residence in December 2016. Dell Technologies acquired Hopkinton, MA-based EMC Corporation for $60 billion in Fall 2016. A luxury residence at the Back Bay’s upcoming 61-story One Dalton tower has reportedly sold for $40 million, which would surpass Boston’s current condominium sale record by $5 million. The sale of a 13,000 square foot penthouse at Downtown Crossing’s Millennium Tower closed last August for $35 million, claiming Boston’s current sales record. The Millennium Tower penthouse sold for nearly $2,700 per square foot; square footage of the One Dalton residence which sold for $40 million has not yet been revealed. Sales of One Dalton’s 180 luxury residences have not yet closed; a number of residences are reportedly under agreement with sale prices starting at $2.5 million. In an interview with Bloomberg, Richard Friedman, CEO of One Dalton developer Carpenter & Company, said that One Dalton is “the fastest-selling residential project in Four Seasons history,” and that about 90% of One Dalton buyers are American, with a large majority hailing from Boston. “We’ve sold to no Russians. Maybe one person from China, but they have a relationship to Boston, and a few units to people from Europe or the Middle East,” said Friedman. Developer Carpenter & Company has released an updated One Dalton website revealing the interior of One Dalton's exclusive condominiums. New interior and exterior renderings have been released along with a One Dalton video; these can be found above. Carpenter has also released a 360-degree animation showing views from the top of One Dalton. 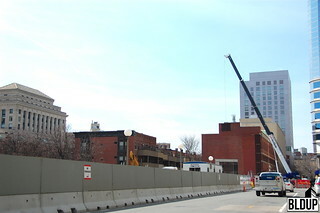 Treviicos has completed One Dalton’s slurry wall, which has been fully excavated by The Welch Corporation. 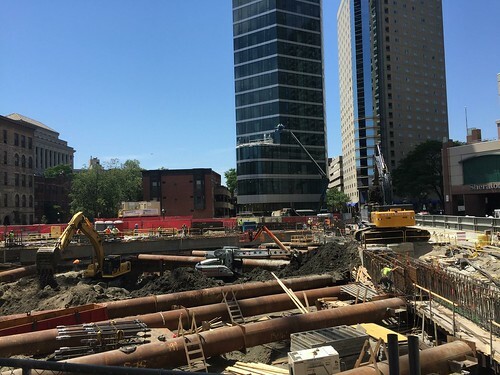 One Dalton’s foundation wall is fully built; a slurry wall is in place along Belvidere and Dalton Streets, and secant piles are in place along the Christian Science Center. The foundation cap beam, which holds the top of the foundation wall together, has been installed. 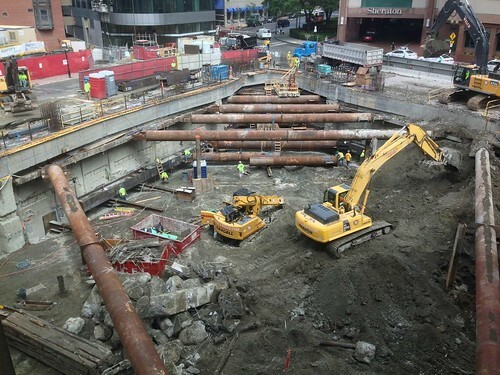 Both the slurry wall and secant piles tie into bedrock over 150 feet below the building. 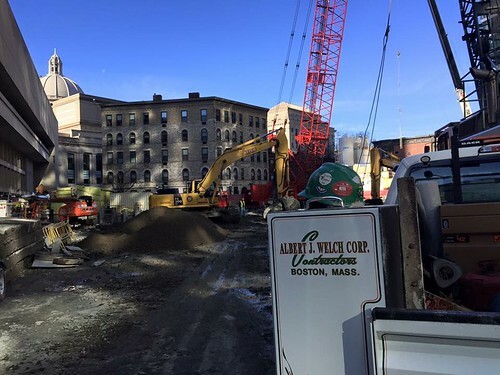 Albert J. Welch Corporation has nearly fully excavated One Dalton’s deep foundation. 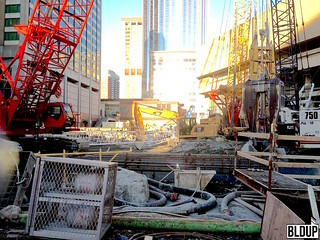 A total of 70 vertical feet of soil will be excavated. 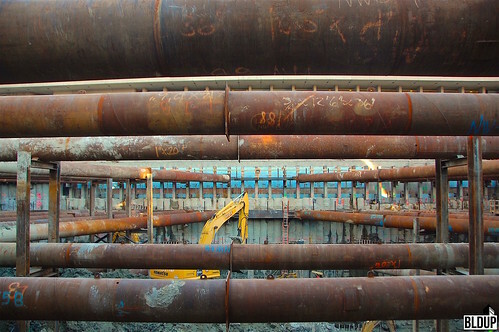 Three levels of horizontal internal brace frames have been installed along One Dalton’s secant pile wall to support the excavated foundation. 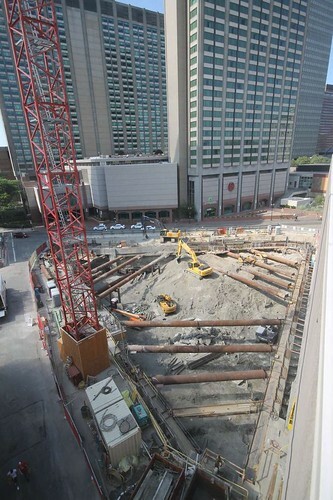 Per the official construction website, secant piles at One Dalton tie into bedrock over 160 feet below grade. 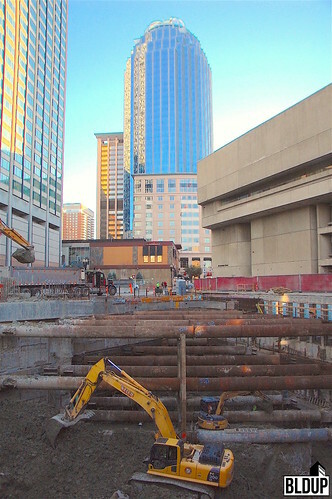 As excavation draws to an end, structural pile caps and H-piles are visible at the base of the parking structure. 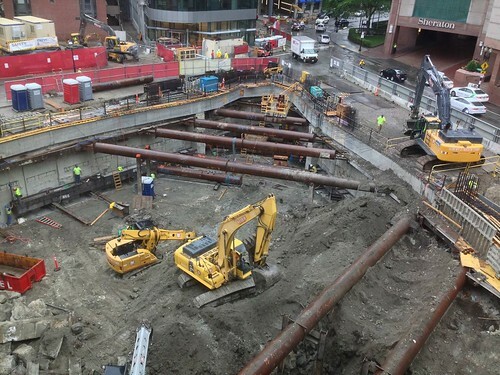 Excavation will soon be followed by pouring of concrete mat slabs along the deep foundation, with superstructure steel and concrete construction commencing shortly thereafter. 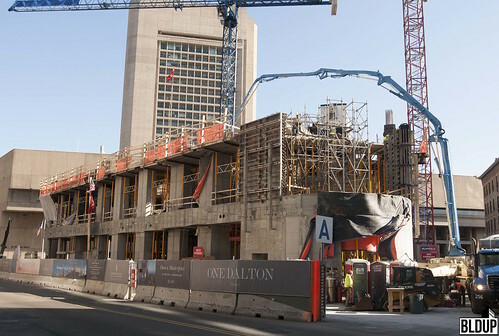 Per the official construction schedule, concrete work at One Dalton is anticipated to commence in October 2016. 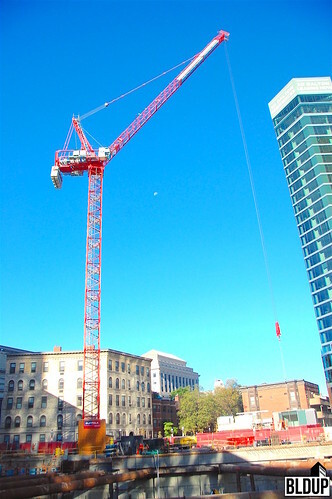 At street level, One Dalton’s tower crane is erected in anticipation of superstructure construction. 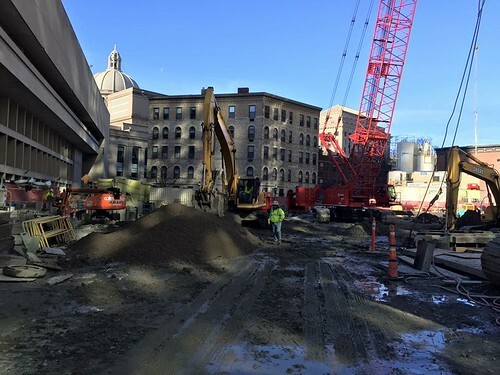 As soil is excavated, the completed concrete form of One Dalton’s deep foundation is being unveiled. 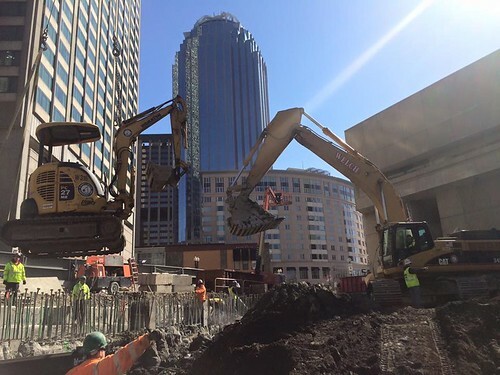 A total of 70 vertical feet of soil will be excavated at One Dalton. 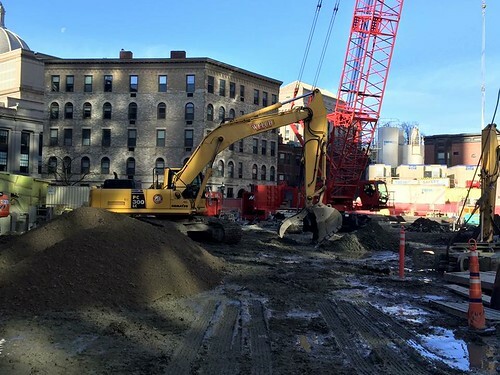 Once all soil is excavated and remaining concrete is poured along the foundation and underground parking structure, One Dalton will be ready to rise. More information about One Dalton is posted below. 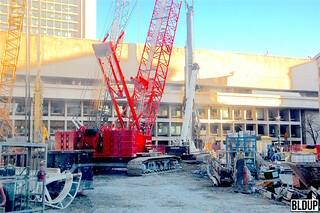 Installation of One Dalton's deep foundation is nearly complete. 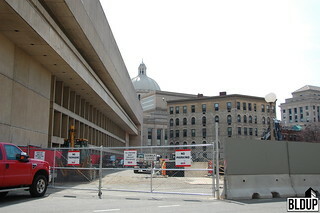 An excavator is parked on site to begin soil excavation of the building's foundation and underground parking structure. 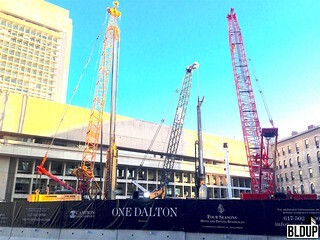 Construction of One Dalton's deep foundation is underway. Piles are being driven ranging from 65 to over 160 feet below grade to provide structural support. The building's slurry wall is also under construction. 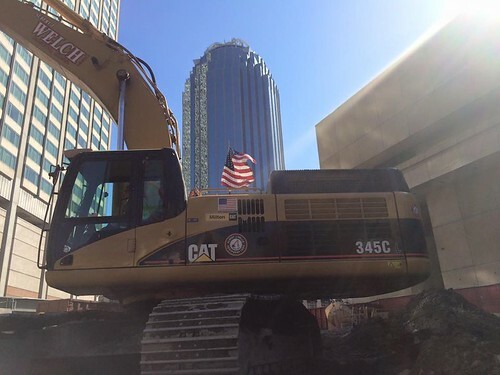 Initial foundation work is underway at One Dalton. Construction fencing has been installed, and slurry wall pre-trenching is underway. Foundation excavation and slurry wall construction will soon commence.